Our new store is now ready for business at Sunway Velocity. We are located at :- Unit V03-08-13, 8th Floor, Designer Office, Sunway Velocity, Lingkran SV, 55100, Kuala Lumpur, Malaysia. 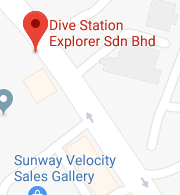 For any further information, please contact us at +603 – 2715 2541 or send us an email at to info@divestation.com.my.